Purify Your Body is now offering a new product. I am excited to now offer Zeolite Pure to go hand in hand with my detox foot pads -- the perfect combination and the quickest way to get detox result! 1. 100% safe and non-toxic at any level: All traces of the mineral are completely eliminated out of the body within 6-8 hours. It's safe for children, pets, pregnant women and nursing mothers. It is also safe to take with most medications (as long as they are not heavy metal based), but as always you should check with a medical professional first. 2. Removes heavy metals & toxins: Micronized zeolite has the perfect molecular structure for capturing and removing heavy metals from the body without removing the minerals your body needs. Many people report feeling increased energy, clarity and vitality after removing heavy metal build up. 3. Helps balance the body's pH levels to an alkaline state: Whenever micronized zeolite is introduced to the body, it buffers the system toward a slightly alkaline state) pH 7.35 to 7.45), which is an optimum pH level for the human body. Zeolite attracts and then buffers excess protons which cause acidity, and this way can help many conditions from acid reflux to candida to arthritis. 4. May help reduce cancer risk. There is clear evidence that micronized zeolite removes toxins that can cause cancer (75% or more cancers may be toxin-related). This does not mean that zeolite is a cancer treatment, nor should a cancer patient use this alone... but it is a great supplement to integrate into a treatment program. 5. Zeolite is easy to take. Most detoxification products are difficult to take and many must be injected into the blood or administered via an enema. Zeolite works at the cellular level, has no taste or odor, and it can be taken on an empty stomach. BUY ZEOLITE NOW AT OUR ORDER PAGE HERE -- Scroll to the bottom to find our great deals on zeolite, and get FREE DETOX FOOT PADS as well. 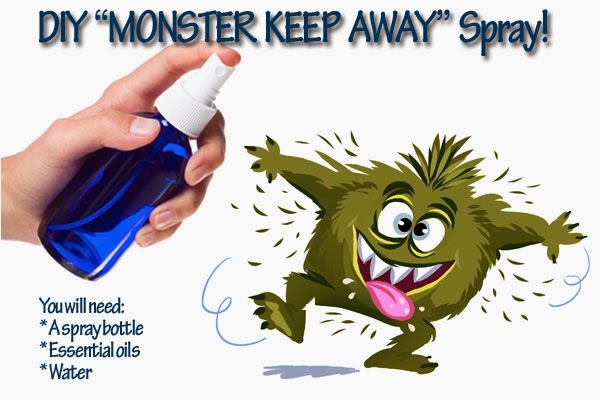 DIY Monster Spray For Your Kids To Keep the Monsters Away! This is another AWESOME recipe from my dear friend at www.essentialanew.com. If you have kids you probably are well aware of the monsters in the closet or under their bed. Just make this spray (you can even have your kids help you make it). Make one for each of your kids to keep with them at night. Be sure to label the bottle "Monster Keep Away Spray". Just add the essential oil drops to the water and shake before use. Everyone knows that monsters don't like the smell of essential oils! Just spray in their direction and keep those "monsters" away. 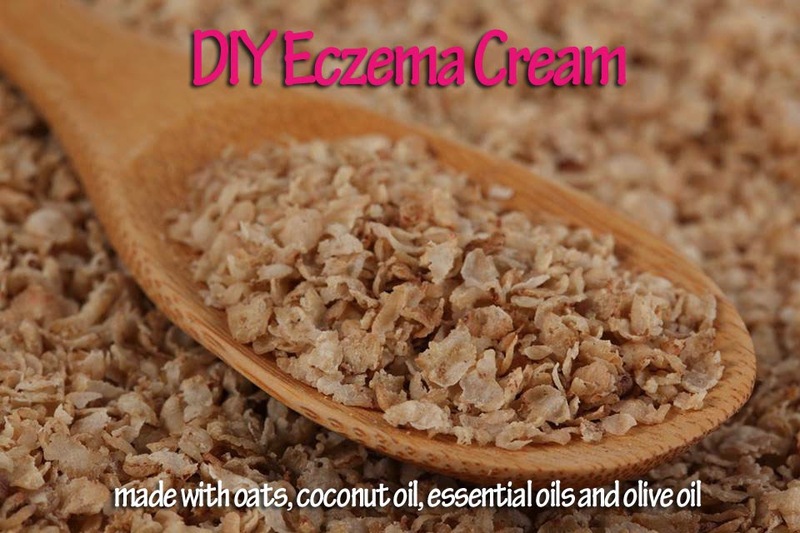 This is a recipe I got from my friend at www.esentialanew.com and I thought I would share it, as many folks -- especially little ones -- are suffering from eczema. Now, I believe that to permanently cure eczema you have to change your diet, test for food allergies (like this awesome test from Life Extensions) and heal your gut (maybe using the GAPS diet). But, for symptomatic relief this may help you! And it is so easy! First grind the oats until they look like powder. Add the EOs to the melted oil, then the oat powder and lastly, add the olive oil. Stir all the ingredients together until the mixture blends, and pour into a container. Apply to the skin and let the healing begin. In September 2005 I had a bad injury to my right hand. Not only did my middle finger get sliced to the bone (through all the connective tissue and nerves), I sprained that knuckle in my hand pretty bad. I ended up at the hand surgeon and while he fixed the nerves and soft tissue as best he could (I still have some hypersensitive nerves on that finger and will always have them), my hand has occasionally acted up with arthritis pain. (I was 30 years old at the time of this injury). My hand was swollen for over 6 months afterward. And I thought nothing of it for awhile, thinking it just needed time to heal. 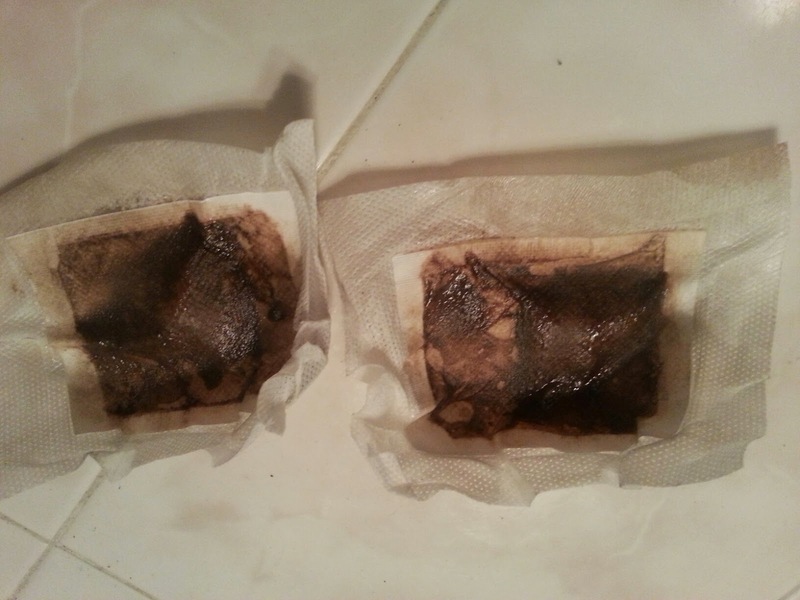 Then, a Purify Your Body Detox Foot Pads customer told me a review of how she used the foot pads on her swollen knee right on the front of it (where it is bony), and the swelling went right down after a single day! I had always told my customers that the foot pads won't work on any bony areas of the body, and that they work in the blood rich areas, like the palm of the hand, not the back of the hand, or behind the knee, not the front of the knee, and on the bottoms of the feet, not the tops, etc. So, this made me decide to try using my foot pads on my swollen hand. I did, and within a couple hours the pad was leaking out so much I had to change it in the middle of the night. I was shocked, and wanted to test my theory so the next night I put them on the back of both my hands: my good, uninjured left hand, and my injured right hand. Same thing happened with my injured hand: Tons of goo within hours. Left hand: absolutely nothing, maybe a teeny bit of darkness around the edges, but nothing noticeable by any means. Just the other day I injured that same hand again, the same knuckle. You never realize how much you count on the middle finger knuckle in your right hand -- almost everything you do has help from that area! I was ready to go to the doctors and get it wrapped appropriately. But it was late at night and while I had been in pain for most of the day already, I figured I would wait until morning. And I put a foot pad on it overnight. The half of the foot pads that is gooey is the area that was over my middle knuckle and index finger knuckle. This was Tuesday morning when I took this picture. All day Tuesday I was amazed at how much better my hand felt. I would say 50% better than the day before. That is pretty good for the amount of pain I was in (and I didn't take any pain pills or anti-inflammatories). So I figured I wouldn't go to the doctor. 2nd night of using the foot pad on my hand. Wednesday, I could barely tell that my hand was injured. Awesome! 3rd night of using the pads on my right hand. 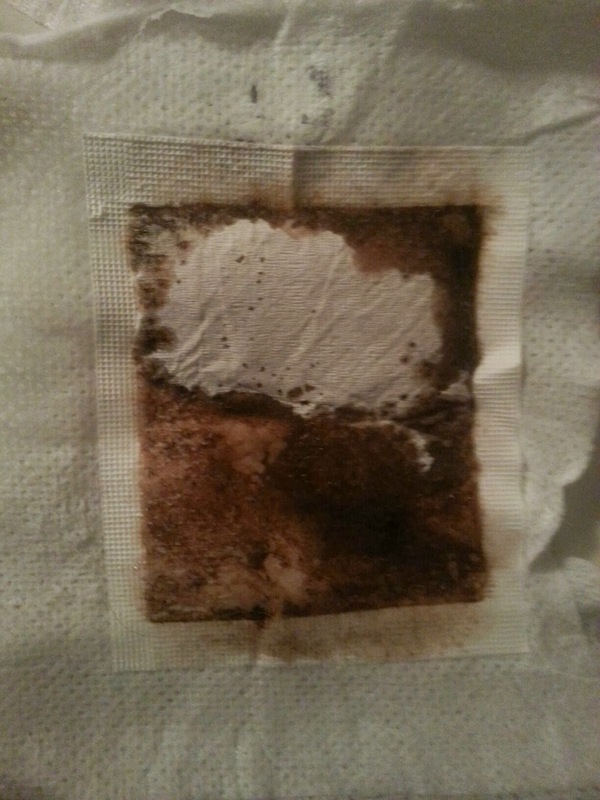 I was pretty shocked that just by changing the location on my hand by less than an inch, the foot pad was filled with this much goo the next morning. I was actually a bit surprised that my left hand even had a little bit of goo on the foot pad after wearing them for 8+ hours, but not surprised at all on my right hand. How cool is that? It is pulling out the inflammation that is preventing the injury from healing quickly. So that when the inflammation is reduced, healing can occur. Awesome! I am all for quick fixes that make life easier, and make me healthier. Here is a picture of the foot pads that I put on my toes last night. When I put them on all other areas of my feet, they aren't filled with goo very much anymore. 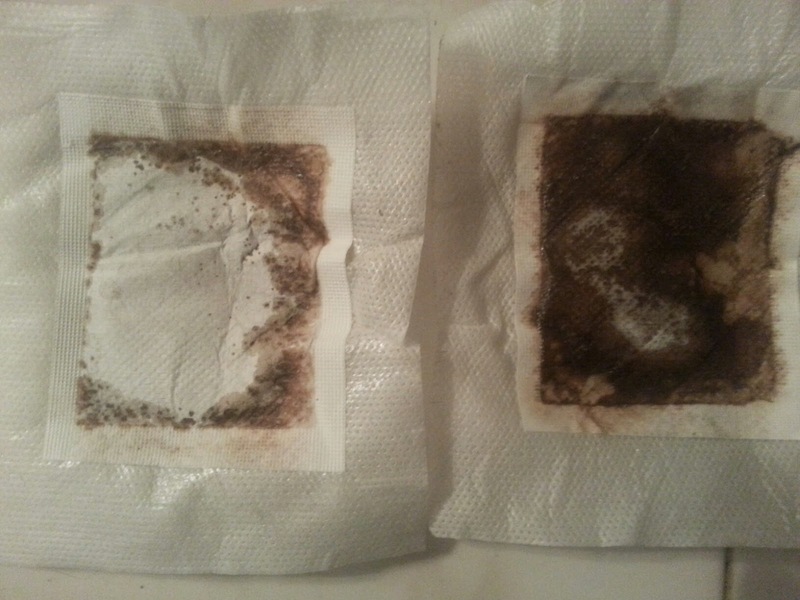 I have successfully detox those areas of my body. 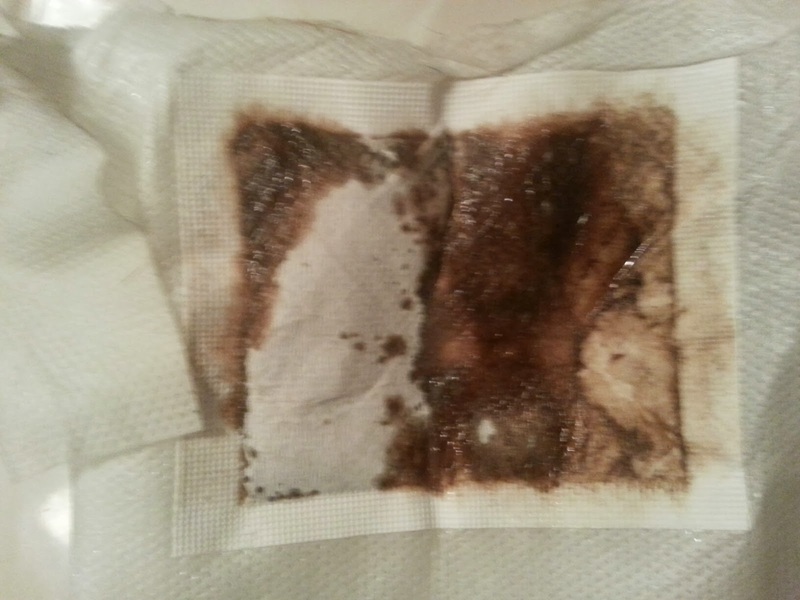 But after so many years, the detox foot pads have NEVER come clean when I put them on my toes. Why? Based on reflexology charts, the toes correlate with everything from your neck, up. This includes your thyroid, sinuses, TMJ, ears, brain, and your mouth. 1. I have thyroid issues. 5. I have had a LOT of dental work done, including a dental implant. Thankfully, I have all my metal fillings removed, replaced by composite fillings. I do not know whether the composite fillings have BPA in them. Knowing my luck, yes. But the implant has a metal screw. From that tooth I constantly have a metallic taste. I just wonder whether these are the reasons why I have never been able to get the foot pads clean. And, I wonder whether all the diet soda pop I drank in my 20s contributed to the tumor in my head and my thyroid issues. But, since wearing the foot pads on my toes (I started wearing them back in 2003 / 2004) my migraines have stopped and my TMJ symptoms are gone. That is a HUGE blessing. I don't wear them every night on my toes. I wear them about 2x per week. I have had a lot of issues with my teeth throughout the years. When I was 14 I got a crown put on a tooth that I had to have a root canal on. (The cause of the root canal was just that my tooth was rotting away from the inside out -- it was not due to improper care, but looking back now I realize it probably was due to lack of necessary nutrients). I remember eating a very chewy caramel candy at a friends house, and then that crown came off. I didn't know what to do so I just put it back on and bit down, hoping it would stay in place. It did. But not after all that contamination from my mouth got beneath the crown. What a crazy idiot (err, teenager) I was! I should have gone back to the dentist and had him clean and sterilize the area and re-bond the crown back on. So... years go by. My tooth slowly decays as a result of the exposure to that sticky caramel candy... which tasted good at the time but totally not worth all that it would put me through in the coming years. Around age 19/20 I start to have REAL problems. I go back to the dentist and he says there is no way to save that tooth -- that we have to pull it. To fill the gap I had to choose between a bridge and an implant. I chose an implant because that didn't ruin the perfectly good teeth next to it like a bridge would. I wish now that I had chosen differently. The implant was a horror story in and of itself. I went to a maxillofacial surgeon and he explained all about the 2-step process... first drill a hole in my jaw, and put a screw in. Then let that heal. The next step would be to put a post in, and then get a fake tooth crown to screw onto that post. Except it didn't work that way. My jaw didn't heal and it didn't look good. I got to be the topic of discussion at one of those dental conventions that they go to each year. Finally the recommendation by all those good dentists was to do a gingival graft. They would cut open the roof of my mouth, and get some connective tissue out. They would graft that connective tissue to my lower jaw bone where it wasn't healing properly. So that is what they did. And it finally healed. I got the rest of the implant done. And I went on my merry way. But... I have a metallic taste in my mouth all the time now in that area. The screw is made from titanium. I don't have any mercury fillings or anything else metal in my mouth, but that metallic taste will not go away. So that worries me. And I am extra vigilant now about taking care of my mouth. I always brushed... at least 2x a day if not more. I hate the taste of my mouth when it isn't clean. I can't sleep at night without brushing my teeth. Seriously, I think maybe there have been less than 5 days in my adult life where I didn't brush my teeth before bed. I am 38 now so that is more than 20 years! So, I have found a regiment that works for me, and I want to share it with you. When I first wake up in the morning I take my thyroid medication. I can't eat for an hour after this, so I wait about 45 minutes and then get a teaspoon of coconut oil and put 3 drops of essential oil on it (I don't like to name brands but it is similar to the Four Thieves Blend). Then, I swish it around my mouth and through my teeth for 15 minutes. It is VERY refreshing and feels awesome. My mouth feels clean the rest of the day as a result, and my teeth are so smooth. Some people claim it helps to whiten teeth, but I have pretty white teeth overall, and so I really don't notice a difference. I make my own toothpaste. I use bentonite clay, Himalayan pink salt, hot water, stevia and essential oils (I usually use peppermint but sometimes I make a batch of cinnamon and cloves). I don't follow a specific recipe but just make it to my taste and desired consistency. 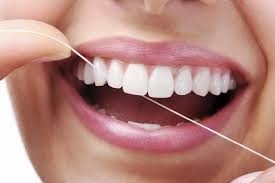 I love to floss as well. Because I have the implant, food often gets stuck under that tooth and that is something I cannot stand. So I floss frequently. Sometimes 3x a day if required. Even though I have pretty white teeth, sometimes they do seem a little dull. So that is where activated charcoal comes in. If you have never heard of this before, or have never tried it, you HAVE to try it to believe it. It is AMAZNG. There are so many wonderful uses for activated charcoal (the most important one is that of neutralizing poisons). 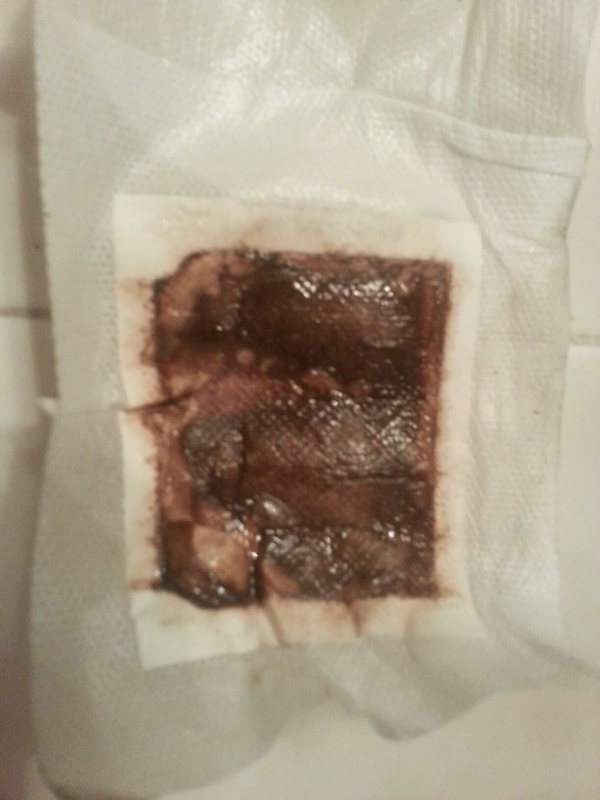 A couple times a month I put some activated charcoal powder on my toothpaste (it is black and makes a HUGE MESS). It looks scary because it is so pitch black. But it works great. So you will want to brush your teeth with this. It attracts anything that stains your teeth and pulls it off your teeth. It works about a million times better than baking soda and peroxide. I don't use mouthwash because of all the bad chemicals in it. But when I need a breath freshener, I will use a few drops of peppermint essential oil and swish it around in my mouth with my saliva, and then spit it out. Essential oils should very rarely be taken internally, and one drop of peppermint essential oil is equivalent to 75 cups of peppermint tea. I don't think it is a good idea to ingest. I know some is getting into my system from the lining in my mouth, but a small portion of 1 small drop of peppermint oil is all I am willing to allow. And last of all, for the health of my mouth and overall, I take fermented cod liver oil every day. Because it is hard for me to swallow gross things, I take it in capsule form. It is more expensive that way, but worth it to me. That is one thing that I have read works to improve the health of your teeth via supplementing. 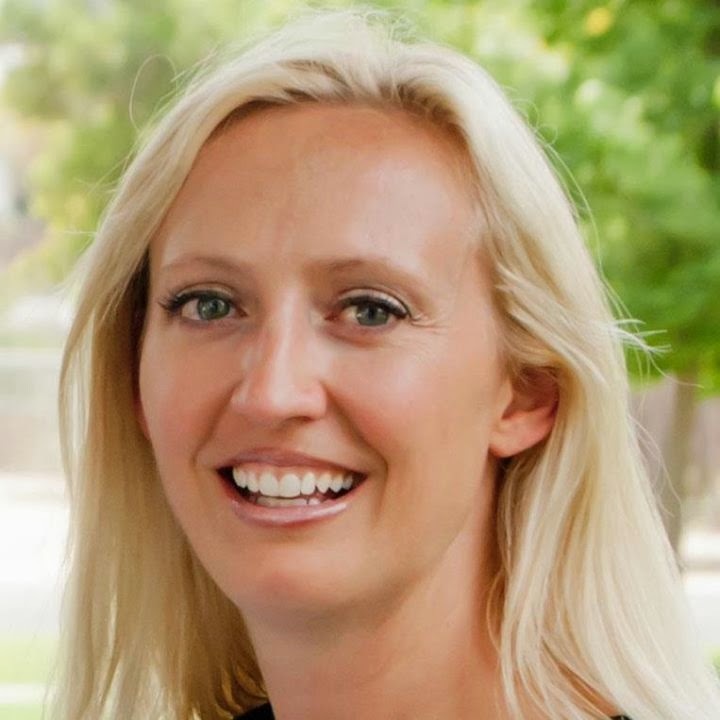 I have read articles that have before and after pictures of horrible teeth, and after doing some of these same protocols, have their teeth do a total about face and become healthy without any dentist intervention. Since many people don't have dental insurance or don't go to get their teeth cleaned religiously, these methods may help you save money, save your teeth and save your health.